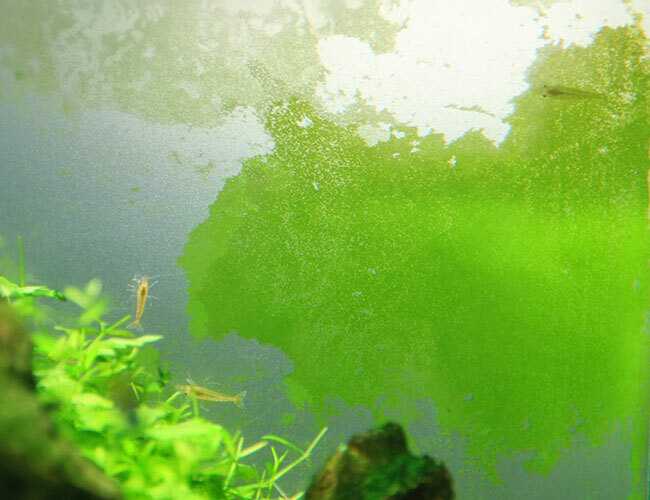 Does your aquarium look like it’s covered in a fine green dust? You might just have an outbreak of green dust algae. But don’t panic! I am going to show you how to identify it, and, perhaps more importantly, how to get rid of this dusty menace for good! What is green dust algae and how do you identify it? What is the cause of green dust algae? Will green dust algae harm your fish? Will green dust algae harm your plants? How do you get rid of green dust algae? Green dust algae (GDA) starts off lightly, like someone dusted your aquarium with green icing sugar. You’ll likely first notice green dust algae appear on the glass of your aquarium because it begins to block the view of your fish. In fact, this algae seems to particularly love glass. So much so that the Germans have a special word for it Grüne Scheibenpest, which loosely translates to green glass plague. In some instances, green dust algae clings to more than just glass. You see, green dust algae is a clinger. It happily sticks to any surface in your tank. Rocks, driftwood, plant leaves – even equipment like filters and heaters. The green dust algae on your glass is typically a lighter shade of green than when it covers your tank decorations and equipment. Rest assured, they are both the same dusty algae. 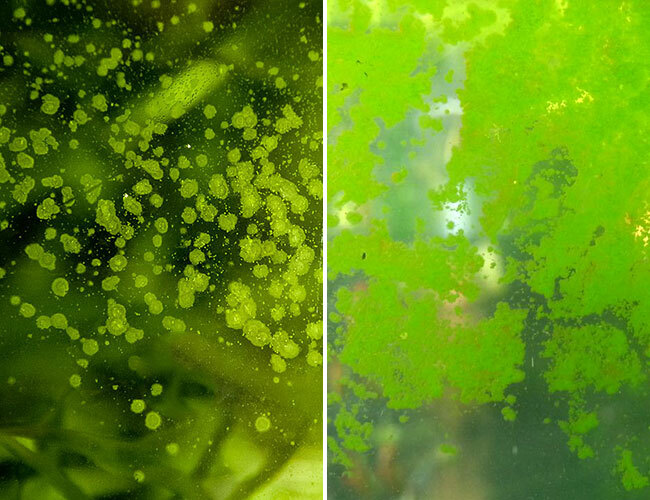 This happens because light hits the algae from both sides of the glass, making it appear lighter in color. I would also like to point out that this algae is a surface clinger. Unless it is disturbed, green dust algae should not turn your water green. See, the water is crystal clear. 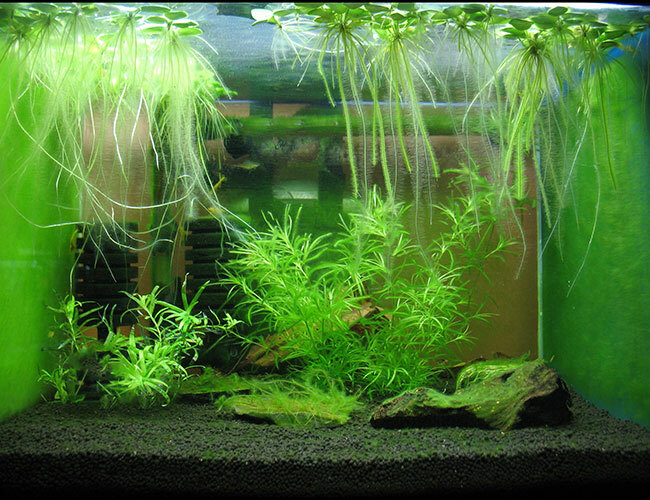 If the water in your aquarium is a green color, then you could be dealing with phytoplankton not green dust algae. Also, green dust algae may be confused with green spot algae. While the two look similar, when compared side by side, the differences become obvious. On the left, you have green spot algae, and on the right, you have green dust algae. Green spot algae grows in distinct circular shapes that slowly merge together. Green dust algae on the other hand is so fine that it resembles… well… dust. Think you might have green spot algae instead? I have a guide for getting rid of that too – check it out! Green dust algae is still something of a mystery. Believe it or not, there is no universally agreed upon source of green dust algae. The exact cause is still very much up for debate. Some people will go their entire lives without experiencing it, while others will forever be plagued by it, no matter what they do. However, there is anecdotal evidence to suggest that the appearance of green dust algae is more common in tanks with too much light. While it may not be the exact cause, this algae appears to love the brightly lit areas of your tank such as the front glass. 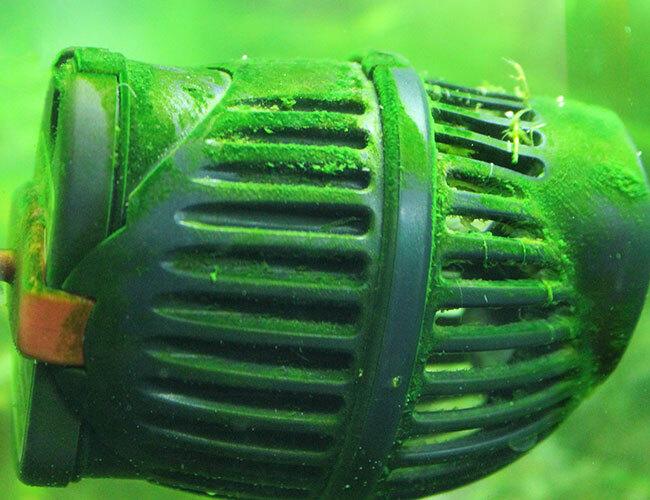 Lowering the light levels in your tank could help prevent green dust algae from appearing. If you have your aquarium lights on for 14 hours at a time, try lowering it to 8. This is easily done by using a plug-in aquarium timer. 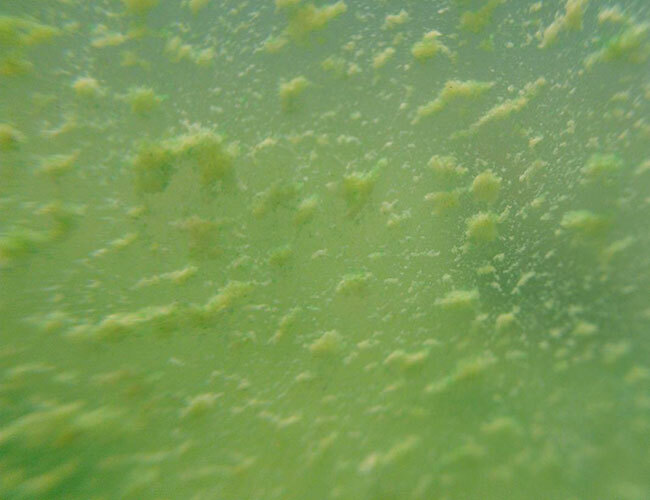 Another theory is that green dust algae spores are introduced into the tank with fish or plants and lay dormant until the perfect conditions arise, such as a nutrient imbalance in the tank or poor water circulation. One reason why no one has cracked the source may be because green dust algae is a universal term for any algae that is dust-like in appearance. It’s possible that while all dust algae looks similar, people are actually dealing with different species. One thing is certain, however, many fish keepers would love a detailed study on green dust algae so that we can finally solve the cause of it. No. Green dust algae is considered harmless to fish. 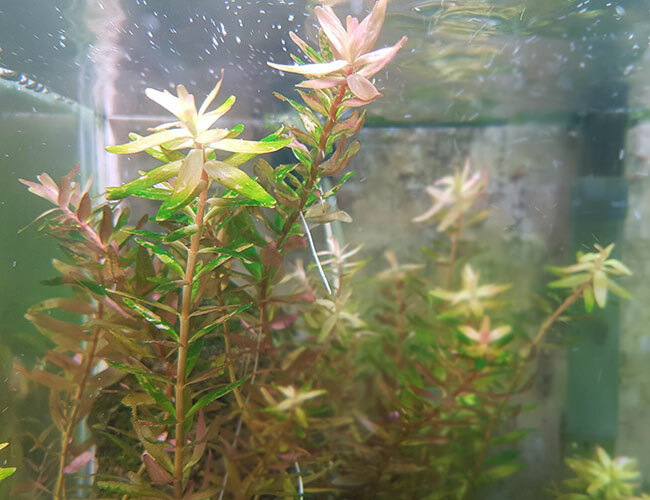 Consider it the same as any other plant in your aquarium. Heck, certain fish happily nibble on it now and then. Some, such as the bristlenose pleco, think it’s the most delicious meal ever! Nope, plants do not seem to be particularly bothered by a light dusting of green dust algae. Surprising, right? It was to me, but I’ve seen plants coated in green dust algae for months that were perfectly healthy once the algae was removed. Is your tank plagued by this dusty algae? It doesn’t have to be this way. I am going to show you how to remove it. Grab an aquarium test kit and check all the essentials. You know – pH, phosphates, nitrates, etc. Make sure there isn’t a nutrient imbalance in your tank. And if there is? Fix it! Remember how I said that you shouldn’t be able to see green dust algae in your water? Well, that’s true. But it’s the stuff you can’t see that you need to worry about. I’m talking about algae spores – so tiny that you can’t see them. 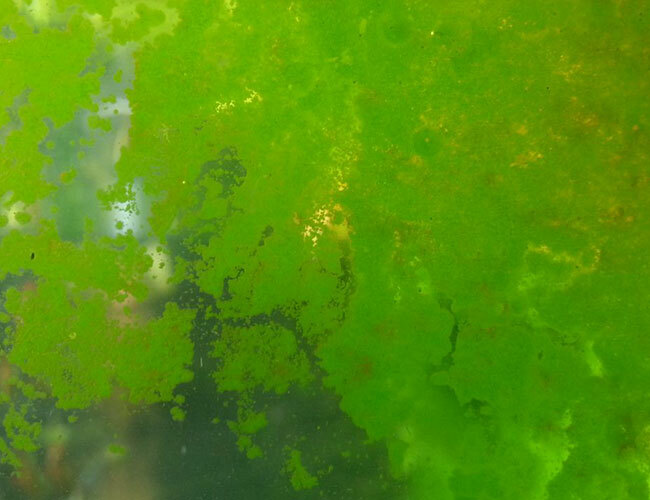 But they’re there, and this is how the green dust algae spreads around your tank. To stop it spreading, I recommend using a UV sterilizer. This clever little device kills the tiny living things that float in your water using light. Commonly used to clear up bacterial blooms, this handy little device also kills green dust algae spores. A viable alternative to the UV sterilizer is a fine filter media, like a 100 micron polishing pad, to trap the algae. Now that your green dust algae can’t spread any more, it’s time to take a look at how to remove it for good. Many fish keepers have had success by manually removing green dust algae. But there is a trick to it. It is suspected that green dust algae has a life cycle. If you wipe it off in the early days, it’s just going to come back. So, what you want to do is remove it when it is in its old age. This might come as a shock to you, but you actually want your green dust algae to grow. 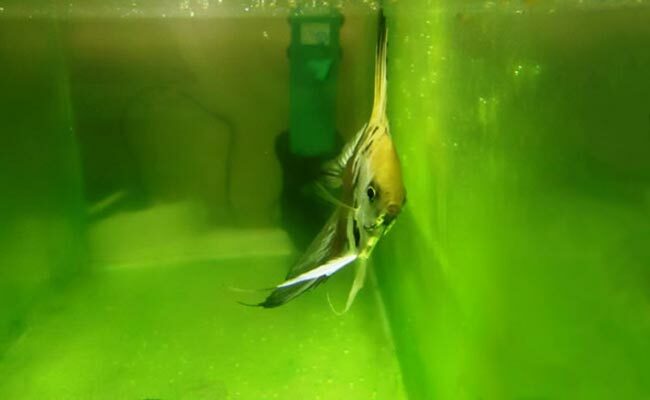 Yes, this is going to leave your aquarium looking like a green mess for weeks, but if you want it gone for good, this is your best chance. 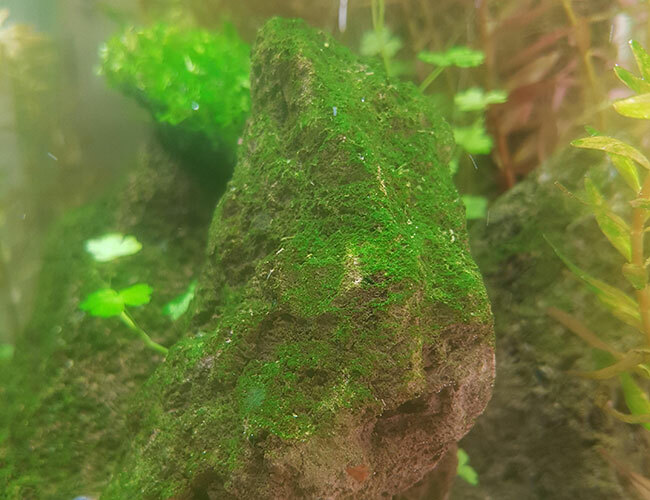 You want to wait at least 4 weeks from the time that the green dust algae first appears in your tank… Don’t worry, it will all be worth it once this dusty monster is gone. 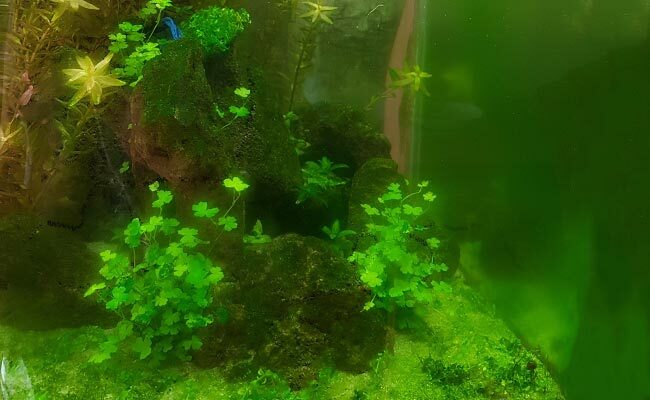 During this time, continue performing regular water changes as usual, but be careful not to bump the green dust algae that clings to the glass of your tank. See you back here in 4 weeks! Bookmark this page so that you can easily find it when you are ready for the next step! Back and ready to move on to the next step? Awesome. Don’t worry, there’s no more waiting involved. Now, what you want to do is drain your tank so that 3-4 inches of green dust algae is exposed above the water line. Grab some paper towels and carefully wipe away the green dust algae so that none of it falls back into the water. Do this in sections, and the moment your paper towel is full, throw it in the trash and grab a fresh piece. Next, take a cloth and slowly wipe up the green dust algae that is sitting below the water line. Go slowly, start at the bottom and wipe upwards. Avoid knocking as much of the algae into the water as possible. Next, lightly spray 3% hydrogen peroxide (H2O2) onto a cloth and wipe it over the cleaned sections of the glass to kill any remaining spores still clinging to your tank. Now, all that’s left is to refill your tank. Make sure you have your UV light running, check your nutrients and cross your fingers. In a few days, you will know if your green dust algae problem is gone for good. Shrimp, snails and algae eaters enjoy the taste of green dust algae. But they just can’t eat it fast enough to eliminate it completely. This thing can carve through green dust algae no matter where it hides in your aquarium. It’s no surprise that bristlenose plecos are one of the most popular solutions to dealing with this dusty menace. 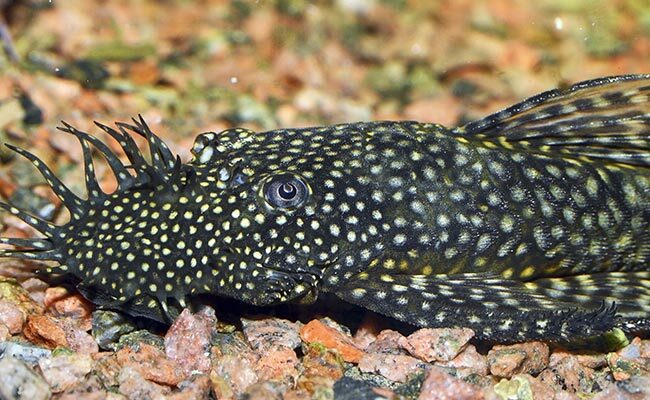 If you combine a bristlenose pleco with manual removal, you have a powerful 1-2 punch that can knock out green dust algae for good. Remember. Once the green dust algae is eaten, you need to provide food for your new bristly nosed friend. If you don’t, he will starve, and that’s not a very humane way to go, is it? 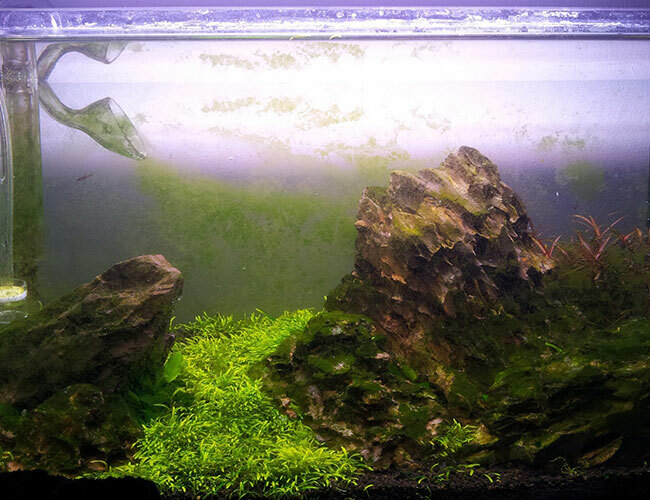 How did you get rid of green dust algae in your aquarium? Let me know in the comments below! Help! I have tried weekly water changes. 2 filters and added filter sheet floss. My tank is 25 gal. and 5 months old. I can only achieve clear water with clarifier. The filter pads are green which I assume is algae. The water again becomes cloudy in 3 days. If it’s algae, then something being added to the tank is providing them with a food source to flourish. You don’t overfeed, by chance, do you? Many fish foods contain phosphorous, which is a tasty meal to certain types of algae. 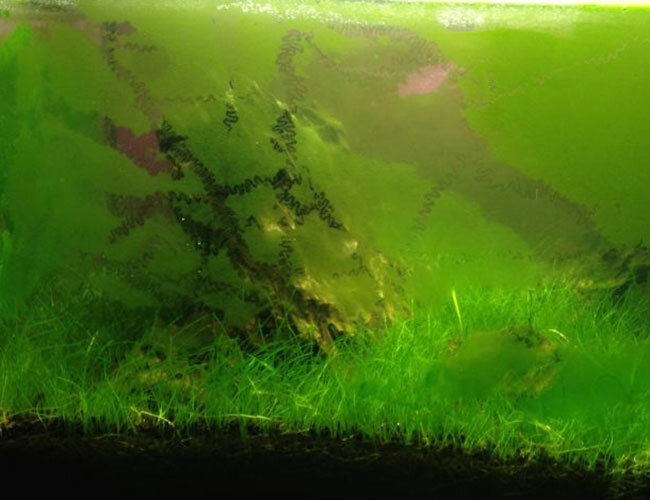 If it’s free-floating algae, your alternative is a UV sterilizer, which is particularly effective at eradicating green aquarium water, and means you don’t have to constantly add clarifier and clean your filter. I’m confused between green dust algae and beneficial bacteria that grows on the side walls of my pond. How do you differentiate between the two? You shouldn’t be able to see beneficial bacteria. You are likely seeing a sludge of different organic matters, of which beneficial bacteria will likely be a part. This article is aimed at aquariums rather than ponds.